Astrid Marklund, Jonas Dahlström and Patrik Svahn with Russ Capper from the GHP (Greater Houston Partnership). It’s already end of September and most people are back in normal routines after a long hot summer. Two weeks ago we had our traditional Business Mixer together with the Norwegian and Danish Chambers here in Houston. It’s a much appreciated mingle event and a good chance to meet up again after the summer and hear what is going on in the Scandinavian community. And the Danish “Smörrebröd” created with love by the chef Sören Pedersen is much appreciated. IKEA donated desert and Swedish “Dammsugare and Princess Cake” can’t go wrong. The Swedish American Chamber in Houston is trying something new this fall when we arrange a Thursday Pea-soup with Swedish pancakes and “Punch”. We found the perfect location at the chef Sörens Pedersens house. So every last Thursday of the month we have an open Pea soup- and Pancake-house, and are happy to welcome people from the Swedish community. No need for registering, just show up, pay 10 bucks and you are in. First Thursdays we have had almost 30 people coming and next opportunity is Thursday, October 29, 5PM-8PM. Astrid Marklund, Jonas Dahlström and Patrik Svahn in the Panel discussions at GHP (Greater Houston Partnership). We are running another interesting joint lobbying project in Houston whit Swedish and Danish Counsel’s and Chambers where we are trying to lobby and push for a direct flight from Houston to Arlanda/Copenhagen. So far we met with relevant organizations and decision makers in Houston, Stockholm and Copenhagen. This kind of project can take very long time but you must start to have a chance. We have sent our first letters and are waiting for hearing back. Please let men know if you have any ideas or connections that can be helpful. 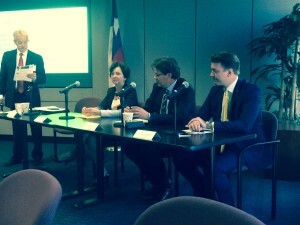 Last week our Honorary Consul General, Astrid Marklund was invited to The Greater Houston Partnership to present “Doing Business with Sweden” for their members. 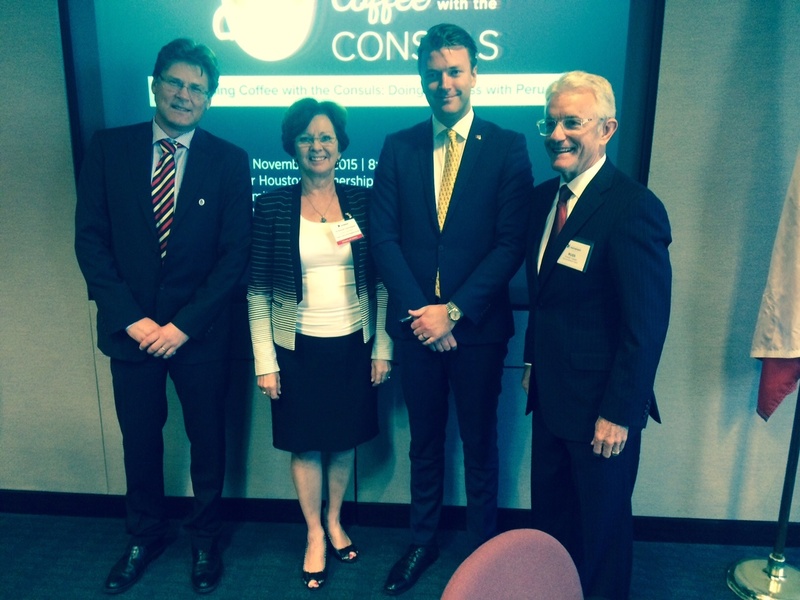 They have a program “Coffee with the Consuls”. I was together with Patrik Swahn, General Manager Stena Bulk in Houston invited to sit in the panel and we had a very interesting panel discussion after Astrids presentation. This is a very good opportunity to market Sweden and the possibilities for other organizations to do business with Sweden. It is a rather challenging time in the world right now and off-course especially in Texas/Houston with the development on the international crude oil market. So I wish you all an interesting fall and hope to see you, at least, one of the Thursdays over a Pea soup and a glass of “Punch”.